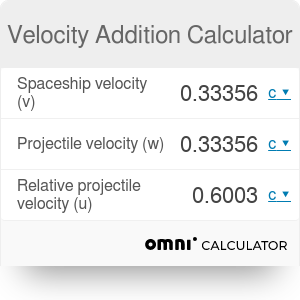 This velocity addition calculator will help you to get a better understanding of special relativity and of the velocity addition formula. You might have heard that the velocities cannot be just added. Instead, we should use Einstein velocity addition equation sometimes called also relativistic velocity addition equation. Interested in relativity? Check out the relativistic kinetic energy calculator! Imagine that your friend is flying a spaceship at high speed and fires a projectile. What is the speed of the projectile? If the speed of the spaceship is v and your friend fired the projectile at speed w (with respect to the spaceship), then it seems logical that you will see the projectile traveling at speed v + w. However, this cannot be true. If instead of the projectile your friend turns on the laser then the speed of light observed by him is, well, the speed of light c. The speed of light is the same for every observer which means that you will see the speed of light is also c, not v+c. This argument shows that we cannot just add velocities. Both you and your friend observe the same speed of light because when moving time passes at different rate and distances seem different. These two effects are time dilation and length contraction. You can see how their work using our time dilation calculator and length contraction calculator. If we combine these two effects, the result is the relativistic velocity addition formula. c is the speed of light (299 792 458 m/s). When the speed of the spaceships or the speed of the projectile is small compared to the speed of light, then the formula reduces to the sum of the velocities u = v + w. However, if the velocities v and w are both large, then the speed of the projectile as seen outside of the spaceship is much smaller then their sum v + w and never exceeds the speed of light. In the extreme case, when one of the velocities is equal to the speed of light c, the other one won't exceed it, either; the speed of light is the same for everyone. You can check other effects of the special relativity with the time dilation calculator, the length contraction calculator and with the famous E=mc² calculator. Velocity Addition Calculator can be embedded on your website to enrich the content you wrote and make it easier for your visitors to understand your message.